I was looking through a fashion magazine one day and was struck by an image of twisted ribbons on a haute couture dress. After sitting and thinking about it for awhile, I figured out a way to twist bands of crochet into a similar shape as the twisted ribbons. The result was a bit different from anything else that I have seen, so I thought it would be nice to share it with others. Feel free to try out different hook and yarn combinations! 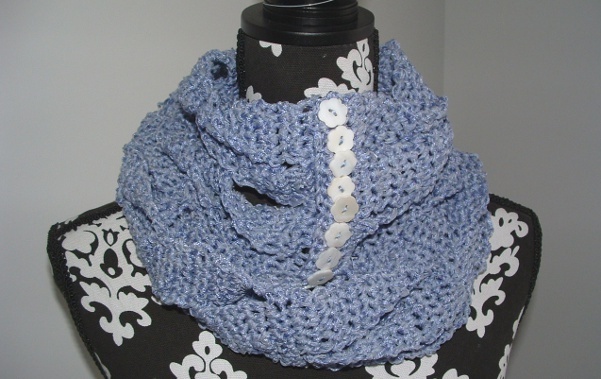 I chose to use a “crispy” ribbon-type of yarn with a silk binder thread. Hand-dyed Fibers.com: I used a custom yarn with a small gossamer ribbon, perle cotton and a binder that were all dyed to match (200 Yards) For a similar look, substitute 200 yds of bulky weight yarn. Note: This pattern can be worked to any length and width, using any multiple of 5 +1 for the base chain. Make sure to use a hook that is a size or two larger than you would normally use for the yarn. Row 1: Ch any multiple of 5 +1 (sample shown used 21), turn and work 1 sc in second ch from hook and each remaining ch. Turn work. Rows 2-4: Ch 1. Sc in each stitch across the row; turn. 1st strip: *Ch1, sc in first five stitches, turn. * Repeat for a total of 15 rows, fasten off. 2nd-4th strip: Attach yarn in the next stitch of the base. *Ch1, sc in next five stitches, turn. * Repeat * to * for a total of 15 rows, fasten off. With the first twist strip on the right hand side, twist the first strip 180 degrees to the right and re-attach yarn to the upper right corner of the strip. Sc in each stitch (5scs), grab the second strip and twist it 180 degrees in the same direction as the first strip and sc across the strip to join it to the first one. Repeat the twisting and sc sequence for the remaining strips to join all together. At this point, the first tier of twists has been completed. Continue repeating from first strip to the twisting sequence until desired length has been reached. After the last joining rows have been done, work one more row of sc and then do the buttonhole row. Ch1, *sc in first/next stitch, ch1, skip the next stitch, sc in next st, ch1, skip 1 stitch, sc in next st*, repeat * to * across the row. Each repeat should take 5 stitches and line up with the last twisted strip. Finishing: Sew buttons onto the beginning end. Make sure all ends are woven in. 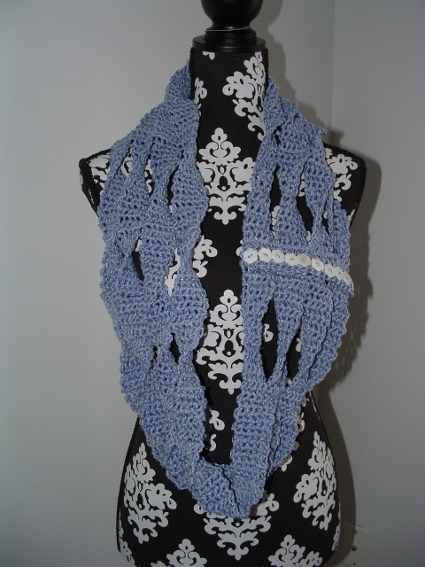 Cheri has been designing in both crochet and knit for over three years. She has a wonderful family who are supportive and often the recipients of her “dabblings.” She can be found on Ravelry as dartfrog911.